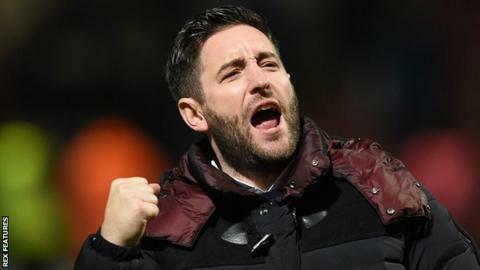 Barnsley have given permission for Lee Johnson to talk to Bristol City about their vacant managerial position. The 34-year-old played for the Robins from 2006 to 2012, scoring 11 goals in 199 games for the club. Johnson left Oldham in February 2015 to become head coach of the Tykes, who reached the Football League Trophy final by beating Fleetwood on Thursday. Barnsley were 22nd in League One in November after losing eight straight games, but have since climbed to 12th. The news came within hours of Johnson being named the division's Manager of the Month for January, having led the Tykes to five successive league wins. He is the son of Cheltenham Town boss Gary Johnson, who was in charge at Ashton Gate from 2005 to 2010. "We gave this permission because we believe that the structures that we now have in place must be the key to our future success rather than dependence on a single individual," Barnsley said in a statement on the club website. "If Lee decides to stay with Barnsley Football Club we will be delighted, but if he chooses to move on, we will continue unabated with the plan we have in place." Bristol City have been without a manager since sacking Steve Cotterill on 14 January, with the club sitting in the Championship relegation zone. Former assistant John Pemberton was placed in temporary charge, but has since won only one of his four games in all competitions.